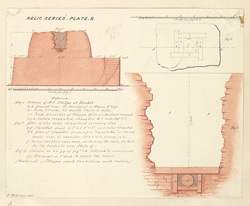 Pen and ink and wash drawing by Frederick Charles Maisey of the section and plan of the Stupa No.2 at Sonari, dated 1847-1854. In 'The Bhilsa Topes' of 1966, Alexander Cunningham described the relics found in stupa No.2, "The second of the Sonari Topes is situated north by west from the Great Tope at a distance of three hundred and fifteen feet...No.2 Tope is...a solid hemisphere of dry stone...raised on a cylindrical plinth...The terrace is 5 feet 8 inches broad, and 12 feet in height. This is gained by a double flight of steps each 20 feet long...No trace of railings or pinnacles couyld be discovered...A shaft was sunk down the centre of the Tope, which at 7 feet reached the slab forming the lid of the relic-chamber...The chamber itself was 1 1/2 foot in depth, and its bottom, where the relics were deposited, was on the same level as the base of the emisphere."